I know this is not expected and I had several other words that I was going to use, but then I went to Amazon and realized that every one the suggestions for me was an agriculture-related book or movie. Growing up city, I had no clue about how much studying there was to do and how many incredible books and magazines there are about agriculture would have never expected that! My first “career job” was working for some farm magazines. I still remember thinking that it was unbelievable that there would be magazines about cotton and rice. Of course, it didn’t take long to understand how much these magazines deliver in terms of agricultural knowledge through sharing the stories of other farmers, extension specialists, marketing experts etc. You can read about the unique things happening right now due to weather, global supply and demand or studies that include thousands of data points and took years to conduct. Cotton Farming and Rice Farming magazines from One Grower Publishing. These are two of the very first publications I had a chance to get to know both as a reader and as a contributor and dear friends still work there. There are a number of weekly tabloids that always garner my attention: Delta Farm Press, Southeast Farm Press, Southwest Farm Press and Western Farm Press and they are now connected to the Farm Progress group of magazines too. Progressive Farmer was one of the first magazines I really respected outside of the ones I worked for and I still remember how Earl Manning was so nice as to give me credit when I worked with him on something. It was founded in 1886 so it has one hell of a history behind it. Farm Journal has been around a little bit longer even, starting in 1877 and had its roots in Pennsylvania. This one is pretty tough, there are a lot of books that could be on this list and I’m going to keep it to a short list. These are books I have found helpful. “Hot Flat and Crowded” by NYTimes columnist Thomas A Friedman is a great read/listen. I think it’s the best statement of the current world situation I’ve seen in a long time. The role of the growing global middle class has some enormous challenges for agriculture and he discusses it fully in this book. A lot to learn here. I loved “Guns, Germs & Steel” and although the focus is history, the role agriculture — cultivating crops and domesticating animals — had in enabling development of civilization is incredible and the sections that address this still blow me away years after I read it. If you like cotton (I do) and world trade impacts you (dare you to say it doesn’t), you should read The Travels of a T-Shirt in the Global Economy. It is an interesting look at how globalization impacts things like a t-shirt with costs, labor, etc. The one I was overdue in reading was Tomorrow’s Table, written by Dr. Pam Ronald a biotech prof who’s husband is an organic farmer. They show that there are ways to talk about differences in agricultural production practices than others would lead you to believe. There is an awesome book produced by the International Cotton Advisory Committee called Cotton Facts. Yes, it is awesome for people like me who love cotton. Next favorite reference book is Cotton Production Today written by my friends Stephanie & Kater Hake and Tom Kerby. This book is based on the input of dozens of cotton experts from the University of California. It’s awesome. 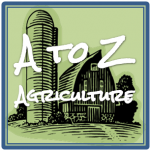 You can also see a great list of agriculture books on Ryan’s Agriculture Proud blog. I also have a post on the top farm books for kids and my friend Val has various farm books she recommends for kids too. The thing that drew me to the topic of reading was the recent reading material I have been absorbed by. 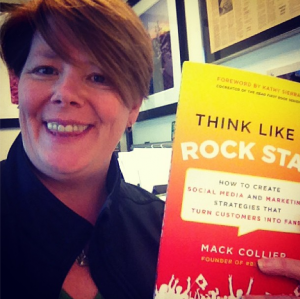 It’s the book “Think Like a Rock Star: How to Create Social Media and Marketing Strategies that Turn Customers into Fans” by Mack Collier, founder of #Blogchat. Yes, that’s the same Mack Collier who I have celebrated as a social media hero for creating the community of bloggers who provide each other encouragement, information, opinions and laughs each Sunday night. While folks may not picture social media books as a key part of agriculture, it certainly has become a larger part. And I have to say I have been recommending it to several people and so far, I’ve only had positive reviews! I wrote up my own review of “Think Like a Rock Star” this weekend for Amazon. You should give it a read whether or not you work in agriculture or have direct knowledge of social media because it will help you “get it” much more clearly. What reads do you recommend? I’m still a day or two behind but I am really pretty proud of the A to Z series accomplishment. You can see the other posts in this series by clicking on the logo at right and reviewing the letters, or by browsing the A to Z ag tag archives. Aw man, I saw this topic and just knew I would have to include my book list in the comments, but I see you beat me too it JP! Thanks! I updated it today, but definitely have some plans to expand it in the near future. I have to keep an eye on your list! Have to see what sort of reading you are up to when you aren’t reading those massive repro books! A book that made an impact on me that I always like to share is The Farming Ladder by G. Henderson. As much a biography of his life as it is a discussion on aspects of farming, his story provides one with an interesting read of the affairs of rural England during post World War 1 and through the 20 years into World War 2. A man before his time, George details how his 85 Acres of intensively applied, sustainable and organic farm became synonymous with quality farming practices. This book was an early influence on me — up till the discovery of this book, I only really considered farming as either something that was out of reach to be commercially viable and that “small holdings” were something that were only usable for small vine plots and self-sustainable ventures. I see George as an early Joel Salatin, demonstrating a mix of what (to him) were “non-fancy”, “common sense” and “easily achievable” approaches to farming, management and commerce. I think it’s important to think about the nature of farming and the methods available that were achievable a half-century ago as a means to consider what is available and repeatable today. I can honestly say that this book is what convinced me to re-consider my approach and plans for a farm and choose to look beyond a few vines, a chicken coop and a house cow. Thanks Tassis for the recommendation and for coming by my blog. I love making the connection to other books, etc. I’m not familiar with it but it certainly sounds interesting. I think it would be great if more people wanted to farm 50-100 acres and had the opportunity to make that sustainable environmentally and economically. I also think its awesome that so many farmers can use environmentally sustainability practices while keeping the farm in the black on a thousand acres or more. While I love agriculture dearly and have a real passion for it, I have to admit my thumb isn’t even on the same spectrum as green! Getting out of the city I live in and visiting farmers who are caring for the environment while growing hazelnuts, almonds, corn, lettuce, etc and while raising livestock gives me a great sense of comfort. This past weekend I went to a friends farm and saw the cattle operation they have as well as several fields he was anxious to plant. When I can get that same awareness from reading a book I get to save the gas mileage too! Shaun, there are lots of digital outlets on the list, they are linked! 😉 I didn’t specifically call out digital-only but you know I know what realagriculture.com does in Canada. 🙂 And I have a massive list of farm blogs I read regularly already on the blog — you can check it out at https://jploveslife.com/blogs-i-read/total-list-farm-blogs/ and I glanced…. Real Agriculture is definitely on the list although I must say the list desperately needs to be updated. Hi Janice, thanks so much for the Think Like a Rock Star mention! I am shaking my fist at Mention for just now emailing me about this mention! Was fabulous to meet you at #TypeACon, hope to see you again soon! Don’t think it is mentions fault… something on the backend of my blog was goofy and a bunch of trackbacks, etc weren’t getting sent. Think the flood gates opened this week. A couple others on my “if you eat read these” – Butchering by Adam Danforth – there’s Beef in one book and pork, poultry, sheep, rabbit, goat in another – both have great meat facts/safety and even if you never butcher, learning what goes into it can build appreciation for those who do it every day. Also In Meat We Trust – history of how our food supply, especially meat, got where it is today. The Essential Good Food Guide – lots of good food info!